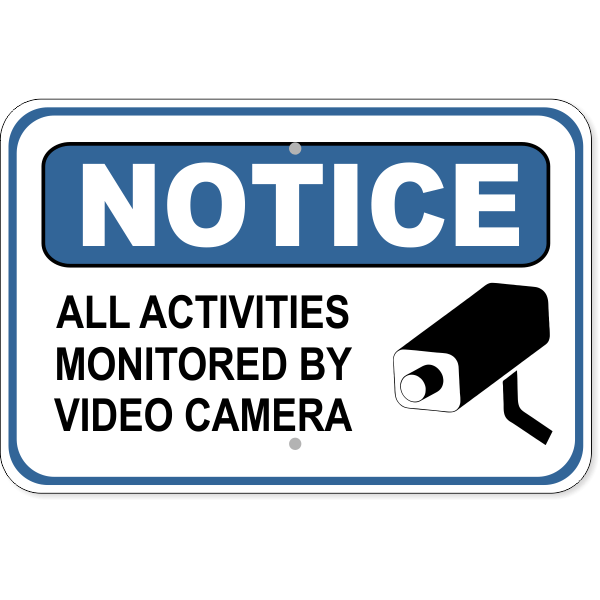 Notify anyone near your property that all their activities are being monitored with this All Activities Monitored By Video Camera Notice Sign where it is visible for all to see. Warning Premises Monitored Aluminum Sign | 12" x 18"
No Trespassing Surveillance Aluminum Sign | 18" x 12"
24 Hour Surveillance Vinyl Decal | 6" x 6"
Install this 12" x 18" Notice All Activities Monitored with Video Camera Symbol Aluminum sign in a visible area to alert visitors or intruders they are being watched. This sign is printed on vinyl and mounted to heavy duty .063 aluminum. Two pre-drilled holes are at the top & bottom for easy installation. Aluminum has 1.25” radius corners to protect you from sharp edges and gives a professional finished appearance. For longer life of your printed sign, add lamination for a few dollars more. Lamination helps protect from UV rays to extend the life of your signs and is recommended for outdoor signage. For roofed parking garages, the vinyl print & aluminum will last for several years without lamination with no sun exposure. Order your 12" x 18" Activities Monitored by Video Camera aluminum sign today to keep your office building safe. Most orders ship the next day!